This article is the the result of my recent online exchanges with fellow Facebook users on the existence of the triune God. Some may argue that the word Trinity is nowhere to be found in the Bible and hence it is unacceptable. This is illogical because there are many instances where new words need to be coined to describe things or concepts that were yet to be defined. It is also a fact that some versions of the Quran made use of the coined word "trinity" like the verses 4:181 and 5:73, to deny the existence of the triune God. Hear, O Israel: The LORD our God, the LORD is one. - clearly says that God is One. This can be interpreted as having two meanings. The first is that this verse stresses God's oneness or uniqueness, and the second is that it can also stresses God's unity. Therefore go and make disciples of all nations, baptizing them in the name of the Father and of the Son and of the Holy Spirit, and teaching them to obey everything I have commanded you. And surely I am with you always, to the very end of the age." - is an explicit reference to the co-existence of the Father, Son and Holy Spirit. Although the doctrine of the Christian God is One who exists as a unity of three distinct persons (Father, Son, and the Holy Spirit) and each of the persons is distinct from the other, yet identical in essence is difficult to understand initially, it will become more obvious after we have searched the scriptures (both the Old and the New Testaments) for the proofs. For a start and at the very beginning of mankind in the Genesis account, God already revealed Himself as a triune God. The "Let us make mankind..." is unlikely to refer to God and His angels because angels can't create something out of nothing in the Genesis account. Only God can! The word Immanuel originates from the Hebrew word עִמָּנוּאֵל which mean "God is with us". It therefore supports the deity of Jesus and alludes Him as one of the persons in the triune God. This verse needs no elaboration that Jesus is the one and same God as the Father. Exodus 34:14: Do not worship any other god, for the LORD, whose name is Jealous, is a jealous God., and Psalm 81:9: You shall have no foreign god among you; you shall not worship any god other than me. - support this hypothesis. "The virgin will conceive and give birth to a son, and they will call him Immanuel" (which means "God with us") - affirms Isaiah 7:14 of the triune God. In the beginning was the Word, and the Word was with God, and the Word was God. He was with God in the beginning. Through him all things were made; without him nothing was made that has been made. - affirms Genesis 1:26 that God is One who exists in distinct persons. I and the Father are one." - supports the concept of the triune God. Thomas said to him, "Lord, we don't know where you are going, so how can we know the way?" Jesus answered, "I am the way and the truth and the life. No one comes to the Father except through me. If you really know me, you will know my Father as well. From now on, you do know him and have seen him." Philip said, "Lord, show us the Father and that will be enough for us." Jesus answered: "Don't you know me, Philip, even after I have been among you such a long time? Anyone who has seen me has seen the Father. How can you say, 'Show us the Father'? Don't you believe that I am in the Father, and that the Father is in me? The words I say to you I do not speak on my own authority. Rather, it is the Father, living in me, who is doing his work. Believe me when I say that I am in the Father and the Father is in me; or at least believe on the evidence of the works themselves. - is also self-explanatory in the oneness and the unity of God. Who, being in very nature God, did not consider equality with God something to be used to his own advantage; rather, he made himself nothing by taking the very nature of a servant, being made in human likeness. And being found in appearance as a man, he humbled himself by becoming obedient to death-- even death on a cross! Therefore God exalted him to the highest place and gave him the name that is above every name, that at the name of Jesus every knee should bow, in heaven and on earth and under the earth, and every tongue acknowledge that Jesus Christ is Lord, to the glory of God the Father. These verses show that God reduced himself, coming in the form of a Jesus, a servant. It teaches us to say "No" to ungodliness and worldly passions, and to live self-controlled, upright and godly lives in this present age, while we wait for the blessed hope--the appearing of the glory of our great God and Savior, Jesus Christ, who gave himself for us to redeem us from all wickedness and to purify for himself a people that are his very own, eager to do what is good. These, then, are the things you should teach. Encourage and rebuke with all authority. Do not let anyone despise you. Titus 2:13 is an explicit reference to Jesus Christ as God and Savior. Who is it that overcomes the world? Only the one who believes that Jesus is the Son of God. This is the one who came by water and blood--Jesus Christ. He did not come by water only, but by water and blood. And it is the Spirit who testifies, because the Spirit is the truth. For there are three that testify: the Spirit, the water and the blood; and the three are in agreement. - is yet another strong allusion to the Trinity God. In short, we don't need to be theologians to recognize the triune God based on what the Bible has said to us. God is 3 co-existing eternal persons. Just because we cannot fathom how God can be fully 3 in 1, it doesn't mean it is not possible or illogical. If we believe in a God who is omniscience (all knowing), omnipresence (all present) and omnipotence (all powerful), then the existence of a Trinity God is not illogical, it is just unfathomable by our human understanding. 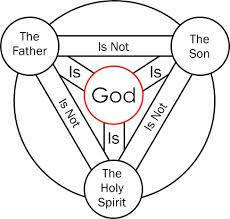 Hope this summary will help to bring about some clarity on the concept of the Trinity God. For those who are interested in the discussion threads, they can be found at https://www.facebook.com/RajaPetraKamarudin/posts/1405643633017265?comment_id=83144 . The Trinity God is one in essence, but three in Person.